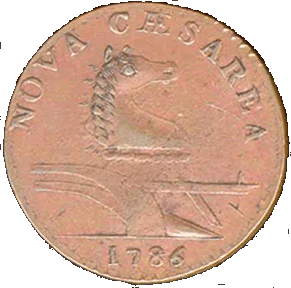 New Jersey Copper Coin from 1786 with New Jersey's latin name "Nova Caesarea" . These were minted between 1786-1790 during a time when the states still minted and printed their own money. 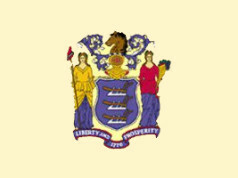 New Jersey – or Nova Caesarea – got its name from the Isle of Jersey off the coast of France in the English Channel and which is part of England. Charles II granted ownership of the New Jersey portion of the newly conquered New Netherlands territory to two people – Sir George Carteret and Lord Berkeley. Carteret, the Governor of the Isle of Jersey at the time, had provided safe haven to Charles II and his family during the English Civil War and as a gift, the king provided New Jersey to him and named this land after the Isle of Jersey. So where does Nova Caesarea fit in? It is believed by the British that the Isle of Jersey is actually named after Caesar during the Roman times which was a common practice back then and was known as Caesarea (Insula) – Island of Ceasar. It is beleived that through the years the spelling and pronunciation had been anglicized until it became “Jersey”. So New Jersey is actually named not only from the Isle of Jersey – but also the great Roman Emperors and really means New (land of) Caesar.